SANTA MAKING HIS ROUNDS WITH GLASSBORO FIRE DEPT. The sirens you are hearing are nothing to be concerned about....unless you've been naughty! 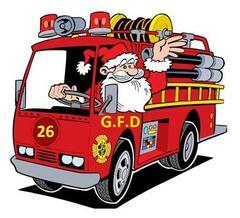 Glassboro Fire Department is making it's annual trip around the Borough with Santa Claus on board. Santa has taken time out of his busy schedule to visit us so make sure when you hear the fire trucks close to your house, you come out and say hello!